3-D Monster: Ya'll Will Get a Kick Out of This! I used to work as a graphic designer for a company in Lewiston, ME. I worked in the art department with a bunch of other weirdos not unlike myself, and for any of you who work for a company who has an art department, you know exactly the type I'm talking about! We used to have all types of art contests, played bocce-ball during lunch break, and were constantly playing pranks. God forbid if you ever went on vacation and your co-workers had a whole week or more to vandalize your cubicle! Anyway, I was going through some old papers today and ran across this gem; I took a day or two off, and when I got back to work, this lovely photo was my new screensaver! The joke behind it was that for awhile I had a bad case of IBS, and was constantly going to the bathroom. By buddy Tim thought it was so funny that he started calling me the "Bathroom Bomber". Soon after, we had a beard-growing contest within our department, and Tim "innocently" snapped this pic with my new facial hair. 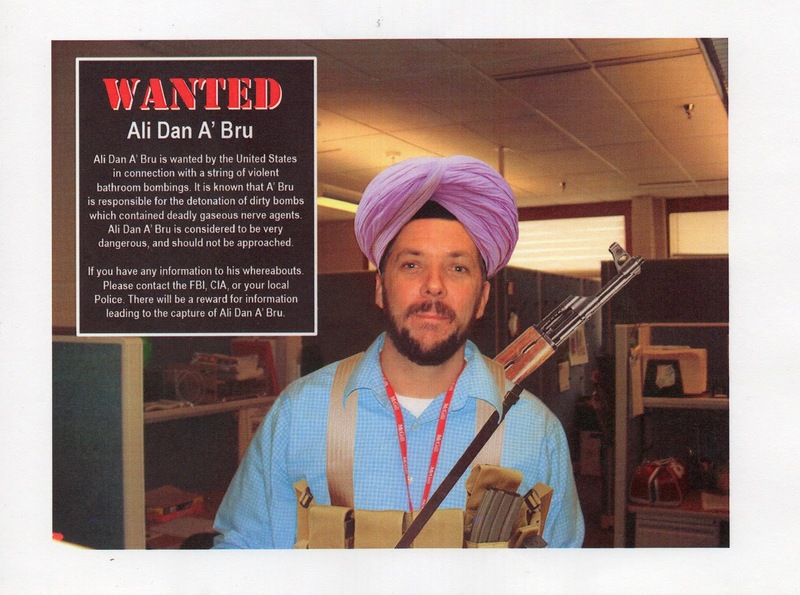 Of course, I wasn't wearing a turban or carrying a rifle at the time, but through the magic of Photoshop, the notorious "Bathroom Bomber" made it onto the most wanted list! Very creative, Timmy! Ah yes! Certainly one of my most favorite works of art. I'm glad you posted it because I had forgotten about it. That was what, five, six years ago? Maybe it's time for an update. Got any other good pics you can send me? Yeah, I found a whole folder full of old stuff from Crestline. Among them was the notorious ransom folder for all of my kidnapped toys! Unfortunately, I have absolutely no good pictures of myself, but thank you for asking!